I just ate a Kit Kat in like .04 seconds. Oops. I should demand that all vending machines be removed from my workplace, because they will eventually be the death of me, I'm convinced. My love for chocolate is actually tied with my love for coffee, which is ranked just slightly below my love for my husband. Last week, I made a new friend. Her name is Katie, and we have so much in common. Katie recommended this book to me, "Jesus Calling." It has a little daily reading, and it's written from the perspective of Jesus, speaking to you. Before I lose you, hang with me. This is not crazy religious stuff, I promise. It's all based on Bible verses. I have been reading them on the Metro on my way to work for the past week or so, and almost every day, they have been SO. ON. POINT. You receive this gift by trusting Me in the midst of life's storms. If you have the world's peace -- everything going your way -- you don't seek My unfathomable Peace. Thank Me when things do not go your way, because spiritual blessings come wrapped in trials. Adverse circumstances are nomal in a fallen world. Except them each day. Rjoice in the face of hardship, for I have overcome the world. So. Um. Yeah. I hear that! I am the QUEEN of getting my way. Of course, I make this happen myself whenever possible. And, like any spoiled brat, when I don't get my way, you better watch out!! Being a Type A personality can be a good quality. I have been quite successful in many areas of my life. But, I have to remember that all of my efforts are worthless without the blessing of God on my life! I am also trying to learn to ACCEPT the Peace of Jesus rather than trying to control my own circumstances to the point that I have enough peace of my own, and I don't realize that I need HIS peace. Case in point: Our little adjustment period I told y'all about yesterday. Last week, I fought the peace. I was frustrated, needy, demanding and unhappy. 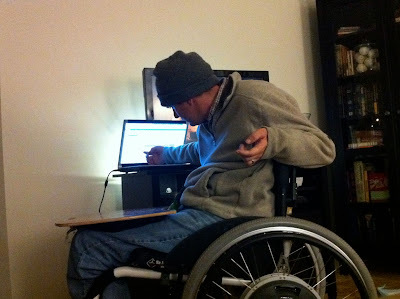 I could have rested in the Peace offered to me, but instead I obsessed over when the home health aides were getting to our house, what they were doing when they were there and exactly how they were doing. I was looking at my phone every 5 minutes wondering why Michael hadn't texted me that they were done. It was not pretty. My dear husband has taught me so much about this same thing. He loves to do things to help me, to serve me and to bless me. But I have to sit down long enough to let him do it. That's not easy when I am such an impatient person that literally waiting 15 seconds for anything feels like it is going to kill me! One day last week, Michael knew I was having a bad day. So, he took the initiative to start on dinner while I was commuting home. 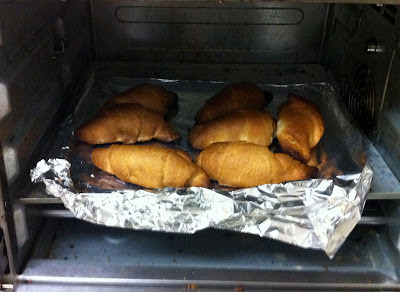 I have to admit, the thought of my quadriplegic husband rolling up crescent rolls and baking them in the toaster oven did give me a couple of heart palpatations. And I figured Brokaw would benefit quite a bit in the kitchen, as M dropped something. But when I got home, there they were. Baked, warm, ready to go. And that's not all. 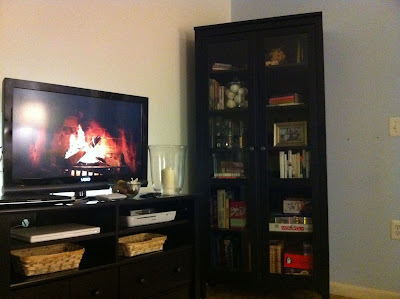 Michael also made me a "fire." And had some soft, soothing music playing in the background. We ate dinner, and chilled out. Then he busted out the Aromatherapy lotion and gave me a really good shoulder massage. It's amazing what those skinny, pointy elbows can do!! 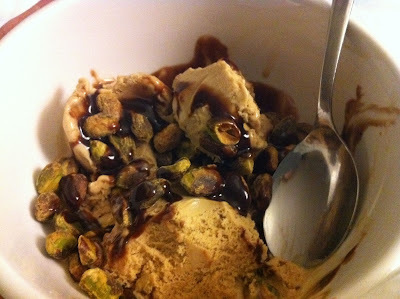 I relaxed some more, reading my Kindle, then we shared a new dessert we tried for the first time -- coffee ice cream, pistachios and chocolate syrup. Try it. It was delicious. My whole point here is that sometimes, we just have to wait for the Peace of God, and stop trying to make our world peaceful, ourselves. Because that night could have been different. I could have rushed home, made crescent rolls while picking up the house, served dinner myself, cleaned that up and served ice cream in a lot less time, and probably with less mess. But this way, there was more Peace, in the end. Marriage really can teach you SO MUCH about God. It's cool like that. Oh, WOW!!! I love this story! What a great lesson for all of us! This is so true. Not easy, but so true. And resting in that peace, there is SUCH....freedom. I hope this doesn't come across preachy, because Lord knows I don't live your situation! But I just wanted to share a quick thought with you. From the outside looking in (thanks for letting us, btw), it seems like the Medicare/Home Health Care thing is SOOOO FROM GOD. I know you know that. But I also know it's probably a super tough gift to receive and rest in. But really, I see the opportunity for peace in that as well.... To know that God has provided something that so perfectly fits a need. And you are completely in His will and favor each time you receive it. As the nurse comes and you have to leave....you are smack dab in the middle of His provision. Right where He wants you to be. I know it doesn't make sense and I'm sure it is unbelievably difficult; I can't even imagine. But in that hardest part of letting go....you are in God's will. I pray for you all often. Kristen, thank you so much for pointing me in that direction. It is a gift! Bless you, my sister, for helping me to open my eyes. You are such a dear friend. I'm encouraged. It is as if we live the same life! Well, insofar as I am type A, and seeing that toaster oven, pointy elbows, and toboggan; all too familiar here. Now if only we could get our dog to pick up stuff Matt drops. Regarding the aides, remember, your husband HATES having to rely on you so much so this is his chance to be independent from you, let him. He is grown and can train them to do all that he needs. No worries! Let me be clear - Brokaw EATS the stuff Michael drops, he doesn't "help pick up." haha! I am so glad you are encouraged, it's great to make a new friend and have so much in common!! I love those pointy elbows, too--ironically they give the best shoulder massages. And it's the absolute worst when they jab you in the side in the middle of the night, second only to splint boots! Cheers to you, my new friend :) So glad God brought us together.